Though the Markets came off 50-points from the high point of the day on Thursday, it still had a relatively stable and strong session. The benchmark Index NIFTY50 ended the day gaining 83.70 points or 0.78%. Though the rise was observed across the board, the stocks and sectors that were beaten down over previous days saw some value buying from the lower levels. From the present structure on the Charts, we see possibilities of the up move continuing on Friday as well. 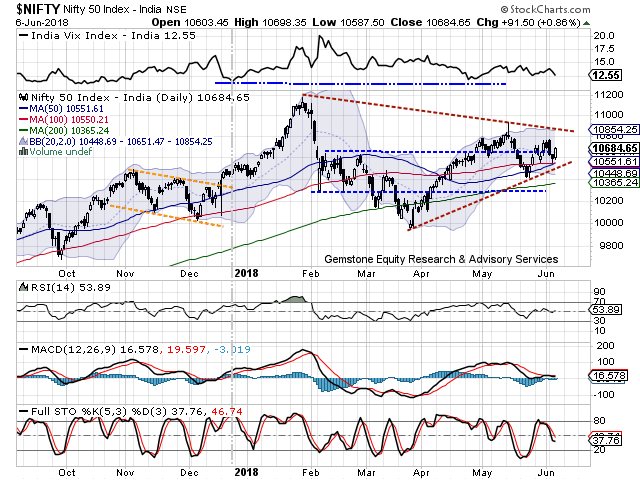 A modestly positive start can be expected but in the same breath, the zone of 10820-10845 will offer resistance to the Markets at higher levels. At these levels, we can see Markets taking a breather and entering into some fresh consolidation before any decisive move. Friday will see the levels of 10820 and 10850 will act as potential resistance zone for the Markets. Supports come in at 10735 and 10680 zones. 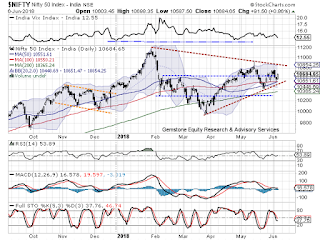 The Relative Strength Index – RSI on the Daily Chart is 58.3524 . RSI has marked a fresh 14-period high which is bullish. It does not show any divergence against the price. The Daily MACD has reported a positive crossover. It is now bullish while trading above its signal line. On the Candles, a Rising Window occurred. It is essentially a gap which implies continuation of the up move. Pattern analysis suggests that the Markets have got some more steam left for some up move. However, these up moves will find resistance in the 10820-10850 zones as this happens to be a major pattern area resistance for NIFTY. Overall, the momentum may persist in the Markets and we may still continue to see the dips, if any, being used to make quality purchases at higher levels. However, in the pursuit of momentum, the zones of 10820-10850 are expected to offer formidable pattern resistance for the Markets. We recommend continuing making fresh purchases with each opportunity that volatility offers, but at the same time, profit needs to be vigilantly protected at higher levels as the possibilities of some volatility and profit taking cannot be ruled out if the NIFTY tests 10820-10850 zones. Long positions were seen being added in SAIL, VEDANTA, CG POWER, BANK OF BARODA, ICICI BANK, POWER GRID, AXIS BANK, YES BANK, UBL, RELIANCE, TATA MOTORS, HINDALCO and ITC.